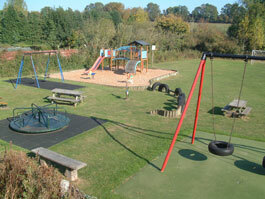 The play area is owned by the Parish Council and has been on the existing site around 40 years or more. The play area had a major “makeover” in 1997 when the new climbing frame and other equipment were installed by local parents following a fundraising campaign. The play area currently has a range of equipment for children up to 12 years old and a football goal. There are also picnic tables at the site. 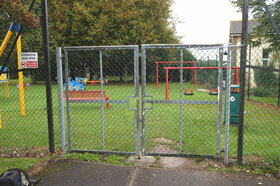 The play area is located on a site owned by Magna Housing Association and leased by Charminster Parish Council. In December 2005 the Parish Council installed a £25,000 scheme of play equipment which was formally opened by Boyzone band star Keith Duffy (the childhood sweetheart of many local mums it seemed!). © Charminster Parish Council, all rights reserved.